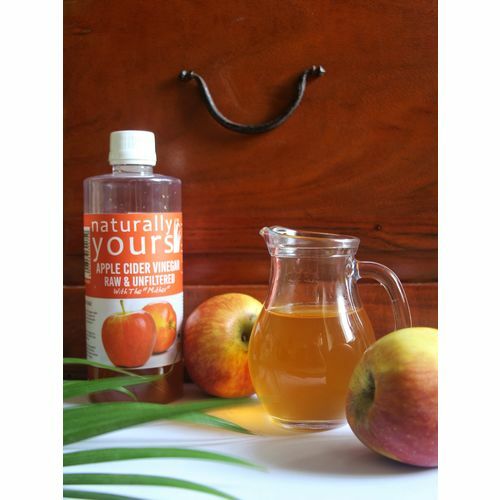 Naturally Yours Apple Cider Vinegar is raw, unfiltered and with mother. It has the optimum recommended acidity level of 5%. Made with delicious Himalayan apple, it is devoid of any additives or harmful chemicals. Naturally Yours Apple Cider Vinegar is raw, unfiltered and with mother. It has the optimum recommended acidity level of 5%. Made with delicious Himalayan apple, it is devoid of any additives or harmful chemicals. Apple cider vinegar has been used for centuries around the world to cure numerous diseases. It is a known fact today that roman soldiers used to stock Apple Cider Vinegar for their long voyages across the world. Apple cider that is raw, unfiltered and with the strands of vinegar mother is a known potent agent to cure many diseases. Health Benefits of Apple Cider Vinegar 1. Healths promote healthy digestion - When apple cider vinegar is taken 30 mins before intake of food helps promote healthy digestive system. 2. Helps Lower Blood Sugar Level - Reasearchers around the world have found postive results in diabetic patients who consumed apple cider vinegar had lower blood sugar levels. 3. Helps in weight loss - It is found that a good diet along with the consumption of apple cider vinegar for a period of 2-3 months helps reduce weight and strengthens your digestive system. 4. Helps reduce Kidney Stones - Apple cider vinegar in diluted form when had for a period of 20-25 days helps reduce kidney stones and the sharp pain associated with it. This is because apple cider vinegar is acidic in nature and kidney stones are alkaline and thus the stones are reduced effectively. 5. Helps fight Heart Disease - Apple Cider vinegar helps reduce bad cholestrol in the body thus helping to maintain a strong and healthy heart. How to Use/have Apple Cider Vinegar? Apple cider vinegar has numerous cures and each cure is different. It is ideal that you consult your doctor/physcian before consumptions for your cure for accurate dosage. However a common and general usage dosage is as follows. Take 2 teaspoon (10ml) of Apple Cider Vinegar and dilute with a glass of water in morning on empty stomach. You can additionally add a spoon or two of honey. Note: Remember Apple Cider Vinegar is a weak acid and should ALWAYS be diluted before consumption.